A small marker sits beneath a stately oak tree on the western portion of the Litchfield Green. 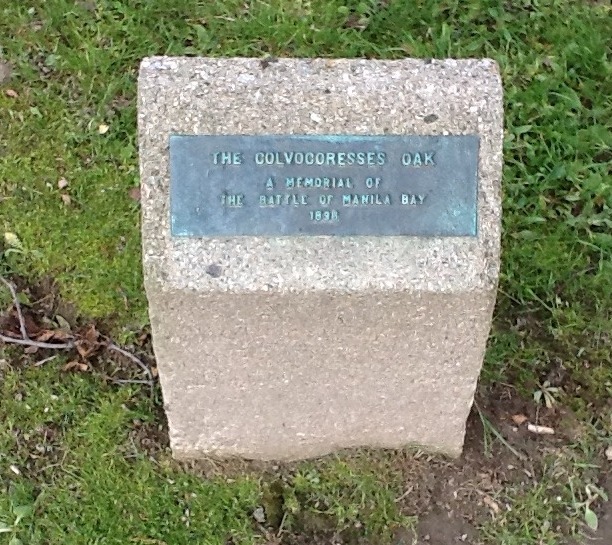 It is located in close proximity to the post office, restaurants, and the historical society, yet one wonders how many people stop to read its simple text: “The Colvocoresses Oak. A memorial of the Battle of Manila Bay.” Upon examination, the curious passerby asks why this small monument to a largely forgotten event of US history stands in the center of a small Connecticut town. George Partridge Colvocoresses was born in Norwich, Vermont, in 1847. His father, George Musalas Colvocoresses, was the son of a prominent Greek businessman. At the age of six, he, along with other members of his family, was kidnapped by Turks. While six of his brothers were killed, George was sold into slavery. His father was able to purchase his freedom, and the son was sent to America. He was adopted by Alden Patridge, who founded the Norwich Military Academy in Vermont, from which George graduated in 1831. The elder Colvocoresses enjoyed a distinguished career in the United States Navy, achieving some fame for his exploits on blockading duty during the Civil War. While in command of the USS Supply, Colvocoresses was joined in the service by his son, George Patridge, named for the family’s American benefactor. Following the war, the elder Colvocoresses was made captain and retired from the service, moving to Litchfield. He was murdered in Bridgeport in 1872. George Patridge, who had left Norwich Academy during his freshman year, took up studies at the United States Naval Academy in Annapolis. After his graduation in 1869, he embarked on a distinguished naval career of his own, serving in many foreign ports, at the Naval Hydrographic Office, and as an instructor of drawing at the Naval Academy. In that capacity he designed the monument to the crew of the USS Jeanette that stands in the Academy’s cemetery. 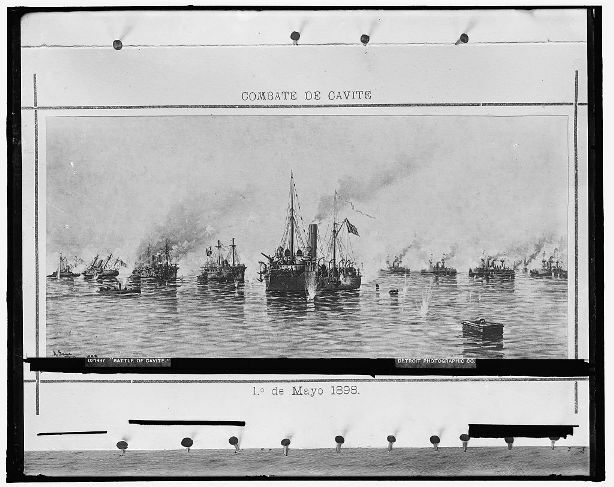 Colvocoresses’ crowded hour came in the Philippines at Manila Bay on May 1st, 1898. While Congress declared the Spanish-American War on April 25th of that year, two months earlier Assistant Secretary of the Navy Theodore Roosevelt had sent a coded telegram to US Asiatic Fleet commander Commodore George Dewey to attack the Spanish fleet in Manila Bay should war be declared. In seven hours of fighting, Dewey (who had opened the battle with the famous phrase, “You may fire when you are ready, Gridley!”) had secured the surrender of the Spanish fleet and Manila Bay, at the cost of 10 American casualties and one damaged ship. When the war ended, the US annexed the Philippines, effectively making it a colony until 1946 when the island nation attained its independence. At the battle Colvocoresses served as the executive officer aboard the USS Concord, which sank the Spanish vessel Mindanao. His actions were noted by a superior, who wrote, “Each and every one of my subordinates did his whole duty with an enthusiasm and zeal beyond all praise. I am particularly indebted to the executive officer, Lieut. 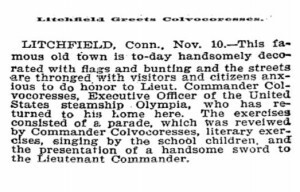 Commander George P. Colvocoresses, for the cool, deliberate, and efficient manner with which he met each phase of the action, and for his hearty cooperation in my plans.” He was later transferred to the Olympia, Dewey’s flagship. 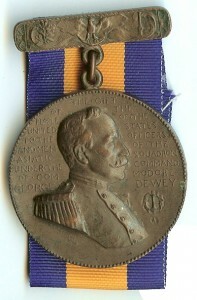 For his service in the battle, Colvocoresses was awarded the Battle of Manila Bay Medal—popularly called the Dewey Medal. There is nothing on the small marker to indicate when it was erected. 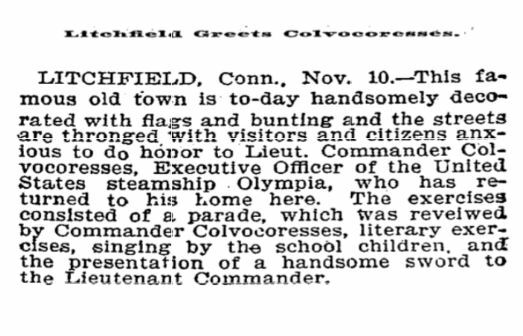 However, the New York Times of November 11, 1899, described the hero’s welcome that Colvocoresses received on his return to Litchfield (see image). Alain White’s history of Litchfield indicates that Colvocoresses himself planted the tree using a silver trowel ordered for the occasion by Mary Quincy, a local actively involved in preserving town history. Perhaps the marker was erected in connection with this event as well. Following the war, Colvocoresses served as the commandant of the United States Naval Academy. He retired to Litchfield. His children and grandchildren continued the family legacy of attending Norwich and serving in the United States military. George Partridge Colvocoresses died on September 10, 1932, and is buried in Litchfield’s East Cemetery. His services at Manila Bay live on, however, commemorated by a small marker and venerable oak tree on the Litchfield Green.